Oh, what a story. 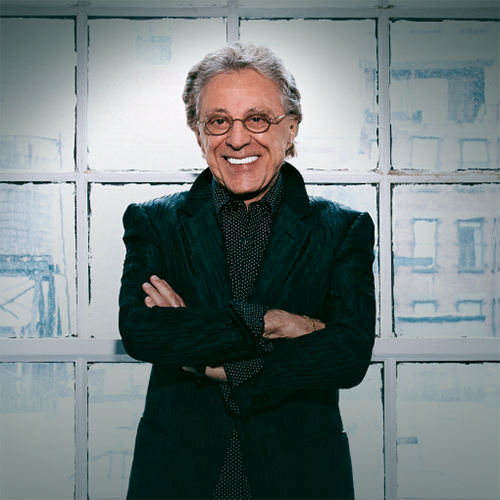 Frankie Valli, who came to fame in 1962 as the lead singer of the Four Seasons, is hotter than ever in the 21st century. Thanks to the volcanic success of the Tony-winning musical Jersey Boys, which chronicles the life and times of Frankie and his legendary group, such classic songs as “Big Girls Don’t Cry,” “Walk Like a Man,” “Rag Doll,” and “Can’t Take My Eyes Off You” are all the rage all over again. With the play on Broadway, and five other casts performing Jersey Boys nightly from Las Vegas to London, the real Frankie Valli is also packing venues around the world. The current excitement prompted Frankie to salute the decade that made him a star with his first new studio album in 15 years. In Romancing The ’60s, he put his own stamp on some of his favorite ’60s songs, the ones he always wanted to record but somehow got away. Produced by Bob Gaudio, an original member of the Four Seasons and Frankie’s long-time partner, the set includes unforgettable new versions of such gems as “Spanish Harlem,” “Call Me” and “Take Good Care of My Baby.” And the album features a guest appearance by four young stars of Jersey Boys, providing background vocals for—what else?—“On Broadway.” Launched amid Jersey Boy-mania, Romancing The ’60s has become the latest classic in Frankie Valli’s half-century of recording.